It's official. The Supreme Court of the United States (SCOTUS) wasted its historic opportunity to re-address the unconstitutionality of anti-polygamy laws. 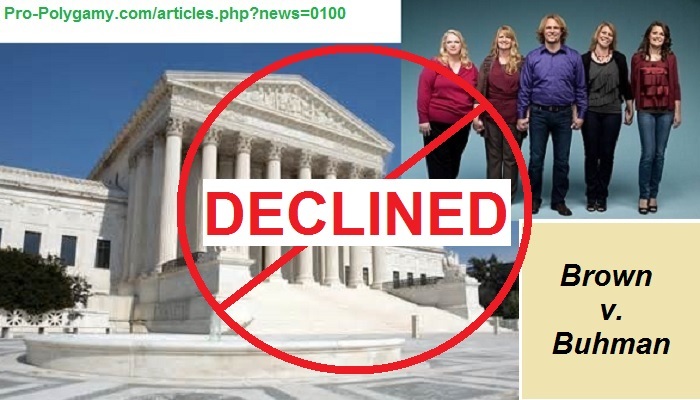 On January 23, 2017, SCOTUS officially declined to hear the "Sister Wives" polygamy case, Brown v. Buhman. Worse, the final steps of this case were not even decided based "on the merits" of any pro-polygamy arguments whatsoever. 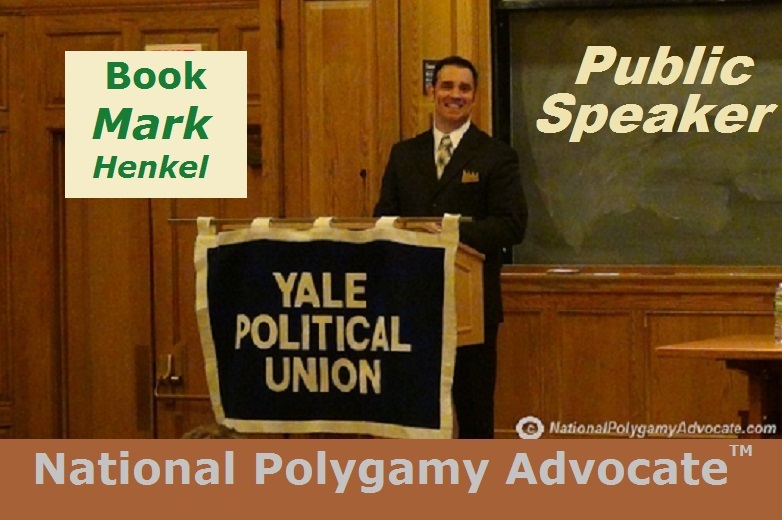 When the Tenth Circuit Court (the last court before the Supreme Court) reversed the lower District Court's decision, it was, as the National Polygamy Advocate ™ Mark Henkel told FOX-TV 10, "not reversed on the merits of any arguments whatsoever. They refused to hear any arguments at all." That was more than unfortunate. The lower District Court had accurately decided that the specific wording of Utah's 1973 anti-bigamy act was, in fact, unconstitutional. Accordingly, that lower court struck down the "cohabits" clause and re-defined the "purports" clause to only apply to legally licensed marriages. As observed from numerous media interviews with National Polygamy Advocate ™ Mark Henkel, most people - even non-polygamists - found that lower court's decision to be so reasonable that they had previously, actually, but mistakenly thought that that was "already" the way the current law worked. But no. Instead of affirming that popularly reasonable de-criminalization of "de facto polygamy" (i.e., plural marriage with only one legal marriage license involved), the next court, the Tenth Circuit Court of Appeals in Denver, Colorado, reversed it. "The Tenth Circuit did not reach any of the constitutional violations of religious freedom, equal protection, due process, or free speech. Instead, it ruled that the district court should have dismissed the case after Buhman announced, in the middle of litigation, that he no longer intended to prosecute the Browns and others similarly situated. Even though Buhman continued to defend the statute's constitutionality, the panel said that it would not consider his timing and motives in issuing this new ‘policy' change, expressly concluding that ‘it does not matter [if] the prosecutor ruled out prosecution because he wished to prevent adjudication of the federal claim on the merits.' The panel acknowledged that a future County Attorney could change this policy at will, but ruled that this possibility too was insufficient to defeat mootness." SCOTUS's refusal to hear this Brown v. Buhman case lets the Tenth Circuit Court's reversal stand. This end-result should, therefore, terrify - if not horrify - every liberty-loving citizen in America, regardless of one's support of or opposition to polygamy itself. Consequently, unconstitutional law may remain on the books. Prosecutors may still use it to threaten to jail otherwise law-abiding citizens and families. Such threatened families may attempt to bring a lawsuit against those prosecutor threats to use the law to jail the families. Prosecutors, even after failing to get a court to dismiss such a lawsuit, may still use the tyranny of "prosecutorial discretion" to declare their invention of any new "policy" to supposedly "not" pursue charges against that specific family. The result is outright tyranny. What hope do any everyday citizens have for successfully bringing valid lawsuits against any bad law when prosecutors are hereby allowed the unconstitutional excess-authority of "prosecutorial discretion" to after-the-fact and unilaterally moot the "standing" of such suit-filing citizens of their choosing? To be clear, the result of Brown v. Buhman is most definitely not an example of the Supreme Court affirming any would-be "constitutionality" of anti-polygamy laws. Any anti-polygamists who assert that falsehood must only be recognized as propagandizing an overt lie. Factually, with its order on January 23, 2017, SCOTUS refused to even hear Brown v. Buhman "on its merits." Rather than hear a historic case about unrelated consenting adult polygamy (UCAP), the Supreme Court has instead allowed the tyranny of unrestrained power for prosecutors to retain any provably-bad law – even beyond any anti-polygamy laws too.